Sisters of Mercy have been ministering in Panama for over 50 years as twelve sisters from Brooklyn, New York, responded to the invitation of the Vincentian Fathers to join them in their ministry. Each of the original twelve sisters committed to living and ministering in Panama for a period of five years. Today, seven Sisters of Mercy live and minister in Panama. One is a sister who arrived from Brooklyn, New York, in 1964, and the other six are originally from Panama. 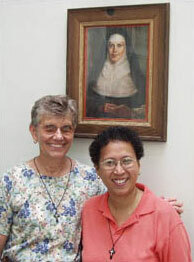 A house of formation and novitiate opened on 12 December 1980, and today the sisters in Panama belong to Sisters of Mercy of the Americas, CCASA Community (Caribbean, Central America, and South America Community), and the Community President for CCASA is Panamanian. Present ministries of the Sisters of Mercy in Panama include MUCEC (Mujeres Colonenses en Camino, or ‘Women of Colon Walking Together’). This ministry, which began in 1985, helps some of the poorest of Colon’s impoverished inhabitants—abused women and children who have little or no income. MUCEC aims to teach self-confidence and useful skills and to instill belief and hope that a better quality of life is possible for even the least fortunate. For further information on this ministry, visit: http://mucec.org/english/nosotros.html. Two Sisters of Mercy work in a mountainous area of Chiriqui (Soloy region) where they travel by foot or by horseback in order to reach the people with whom they serve. 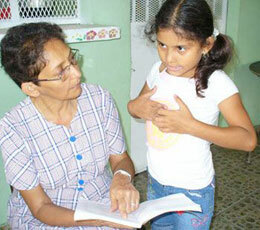 Their ministry “Seeds of Hope” is a collaborative ministry with the Vincentian Fathers. Ninety seven percent of the people in this area of the country live in severe poverty, and 60% suffer from malnutrition. On 8 May 2008, the mission team of Sisters of Mercy and Vincentian Fathers accompanied the indigenous peoples and campesinos in a non-violent demonstration expressing their concern over the destruction of the river on which they depend for all of their water needs. This river is threatened by the construction of huge hydroelectric plants which generate electricity sent to faraway places such as Las Vegas, Nevada, USA. A You Tube video of this demonstration and the government’s response can be found at: http://www.youtube.com/watch?v=dK1Q4hYee44.